The Architecture Foundation has created the first comprehensive survey of masters-level architectural design teaching in London. The site aggregates all 88 MArch and Diploma studios from London’s eleven architecture schools into a single searchable database. The project intends to connect cutting-edge thinking in architecture and design, making it easier for tutors or students to find and connect with people researching similar issues across institutional and geographic boundaries. 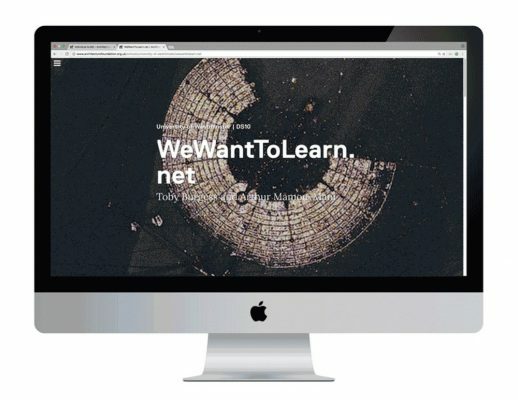 The foundation is planning to develop the project for the next academic year possibly expanding the database to include architecture schools outside of London and the UK. They have created a Frequently Asked Questions page with further information about the project on their website. Architecture Foundation Members’ Tour of Culham Chapel, near Henley on September 3rd. 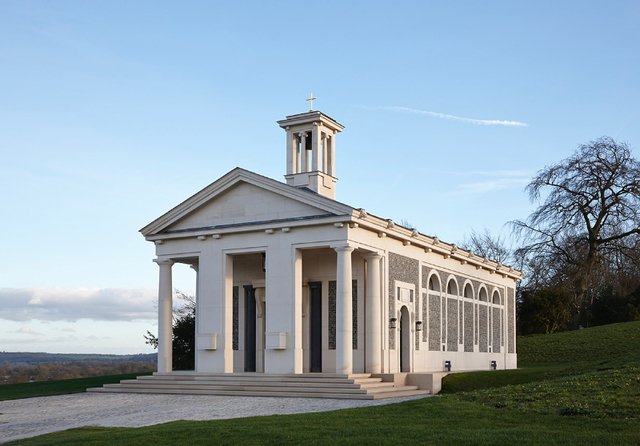 Designed by Craig Hamilton Architects, Culham Chapel occupies a site overlooking the Thames on a private estate outside Henley. Eight years in the making, the building conceals a highly ornamented interior within a chaste shell of portland stone and flint. This is a gesamtkunstwerk without recent parallel: every detail – down to the scale of the bronze door handles – has been designed by the architect. Incorporating a crypt and two side chapels, the building serves the workers on the Culham Court esate and is open to the wider public on one Sunday of each month. It was consectrated at the end of last year but a highly amitious sculptural programme being delivered by Alexander Stoddart is expected to take a further decade to realise fully. Led by Craig Hamilton, the tour offers Architecture Foundation members an opportunity to visit one of the most richly conceived works of architecture – classical or otherwise – built in Britain in the past century. NOTE: To secure access to the Culham Court Estate, attendees will need to provide their vehicle registration number in advance to mail@architecturefoundation.org.uk Proceeds from ticket sales will be donated to the chapel. The Architecture Foundation is inviting applications to join a masterclass, which will be staged in the James Stirling-designed Florey Building at The Queen’s College, Oxford. Born in Ghent in 1975, Kersten Geers graduated in Architecture and Urbanism at the University of Ghent, Belgium and at the Esquela Tecnica Superior de Arquitectura in Madrid, Spain. He worked with Maxwan Architects and Urbanists and with Neutelings Riedijk Architects in Rotterdam before founding OFFICE Kersten Geers David van Severen in 2005. He was professor at the University of Ghent, and visiting professor at Columbia University, NYC, and the Academy of Architecture in Mendrisio (CH), and is currently teaching at the EPFL, Lausanne (CH). He is a founding member of the architecture magazine San Rocco. Tom Emerson and Stephanie MacDonald founded the London-based practice 6a in 2001, after meeting at the Royal College of Art. Tom. He has taught at the Architectural Association and the University of Cambridge and published articles on architecture, literature and art. In 2010 he was appointed Professor of Architecture at the eth Department of Architecture in Zurich. Stephanie has developed the practice’s collaborative approach working with artists, fashion designers and scientists and leads the material research of the studio. Recently completed projects include a house and studio for Juergen Teller in London. Born in 1970, Emanuel Christ graduated from the Swiss Federal Institute of Technology (ETH) in Zurich in 1998. In the same year he and Christoph Gantenbein founded their firm Christ & Gantenbein in Basel. The office’s activity ranges from small transformations, to housing, office buildings, bridges, and urban master plans. One of their main focal points is museum architecture. They have recently completed the extension to Basel’s Kunstmuseum, and the renovation and extension of the Swiss National Museum in Zurich. Since 2010 Christ and Gantenbein have been teaching together as professors at the ETH Zurich. Andrew Clancy and Colm Moore studied at University College Dublin, Andrew graduating in 2001 and Colm in 2002. Founded in 2007, their Dublin-based practice is engaged in the design of both architecture and products. The practice’s Slievebawnogue Houses won the 2012 AAI Downes Medal for Excellence in Architecture. Andrew is Senior Teaching Fellows to the Masters of Architecture at Queen’s University Belfast. Current projects include a new house in Somerset. Oliver Lütjens and Thomas Padmanabhan founded their practice in Zurich in 2007, having both previously worked for Diener & Diener in Basel. Both have previously acted as teaching assistants at ETH Zürich, Oliver in the studio of Adam Caruso and Thomas in the studio of Peter Märkli and Markus Peter Both have written for San Rocco and in 2012 were part of the San Rocco group exhibition at the Venice Biennale. Recent projects include an apartment building on Herdenstrasse in Zurich (2016). Are awards’ dinners networking extravaganzas, or important platforms for the celebration of architectural quality? Can prizes encourage clients to commission agenda-setting architecture, or are they cliquey back-slapping exercises? Does the system offer a vital platform for a public discussion of the built environment and the visibility of the profession, or cultural camouflage for real-estate endeavours? Following the inaugural event exploring competition-culture last month, the ‘And the Winner is…?’ series returns in May 2013 with an investigation into the purpose and impact of architectural awards, as part of The AF’s new series of critical explorations into architecture’s cultural systems for generating, assessing, and presenting projects to the public. The AF is delighted to have The Architectural Review as the media partner for this important series. In the lead up to the announcement of key 2013 architectural awards – with the Mies van der Rohe Prize for European Architecture, RIBA Awards and the Pritzker Prize all due to be handed out in Spring 2013 – ‘Awards: What Are They Good For?’ will critique and explore the culture of award giving and the effect of prizes upon the architectural profession and what gets built; asking who really wins, how, and why. Coverage of the Stirling Prize may have been dropped from live TV in 2012, following a 10-year run on the airwaves, but new awards keep arriving on the scene; from industrial accolades to international celebrations of new architecture, from self nominating pay-per-entry web-platforms to juried conferring of trophies from on high. Awards are growing in number and size, with diverse parameters, sponsors and objectives. But is this glut of awards reducing the significance of the culture of prize giving? How can awards best be used to celebrate and stimulate architectural quality? The event, taking place in The AF’s Central London Project Space on Thursday 2 May, will see an invited international panel of key award representatives, critics and practitioners present their motivations, position towards, and experience of awards – to determine together how awards and prizes can best recognise and encourage quality in the built environment. The event, chaired by Paul Finch (Chairman, Design Council CABE), will feature participants Farrokh Derakhshani, Director, Aga Khan Award for Architecture; Tony Chapman, Head of Awards, RIBA; Martha Thorne, Executive Director, The Pritzker Architecture Prize; Simon Allford, Director, AHMM; Christine Murray, Editor, Architects’ Journal; and founder of Los Angeles and Zurich-based agps architects, Sarah Graham, who will represent the Global Holcim Awards. Further participants to be announced. ‘Awards: What Are They Good For?’ follows the first event in ‘And The Winner Is…?’ series, ‘Competitive Advantages?’, which saw an international panel investigate the issues that architectural competitions raise from the perspectives of architect, organiser and client. A full recording of that event is now available online on the AF website. The final event in the series – ‘Urban Exhibitionism?’ – will explore how architecture and cities put themselves on show through design festivals and biennales, and will take place as part of the 2013 London Festival of Architecture. The And The Winner Is…? series aims to act as a real-time think-tank, aiming to ascertain positive and negative lessons to propose how these mechanisms can better benefit the profession of architecture and its public. Each event offers an independent forum for contributors and stakeholders in these systems to present and defend their positions, and to determine together how they might best shape and participate in them in the future. As such, the events should be an essential ticket for all those involved in the practice of making architecture happen. The Architecture Foundation is delighted to announce an international Open Call for innovative independent exhibitions and installations for its central London Project Space. The AF Project Space is intended as an incubator for independent positions and architectural experimentation and with the Open Call the AF is excited to give individuals, organisations, artists, architects and curators the chance to use the space as a testing ground for experimental modes of exhibition. Competitively selected through a jury process, the AF is keen to receive proposals that test the limits of the Project Space from 1:1 scale spatial experimentations to exploratory exhibitions and public residencies. Two projects will be selected to for delivery in 2013 with the Open Call becoming an annual addition to the AF core programme. The selection board comprises of AF Senior staff, and an invited Curatorial Advisory Board of architecture, urbanism, art and design professionals including Eleanor Fawcett, London Legacy Development Corporation; Moritz Kung, independent curator; Erin Manns, Victoria Miro Gallery; Oliver Wainwright, Building Design/Guardian; Finn Williams, Common Office/Croydon Council; and Liam Young, Tomorrow’s Thoughts Today. Founded in 1991 as the UK’s first independent architecture centre, The Architecture Foundation is a non-profit agency for contemporary architecture, urbanism and culture. We cultivate new talent and new ideas. Through our diverse programmes we facilitate international and interdisciplinary exchange, stimulate critical engagement amongst professionals, policy makers and a broad public, and shape the quality of the built environment. We are independent, agile, inclusive and influential. Central to our activities is the belief that architecture enriches lives.